Helen Hillard’s Story - Fairlawn Brought Me Back - 28 years & thousands of comeback stories. Tell Us Yours! When 83-year-old Helen Hillard went into the hospital for heart surgery, she fully intended to quickly return to her full time job with Hill and Hillard, a thriving real estate company she and her son had owned for more three decades. The company was the second one Helen had headed up during her lifetime. Before that, it was an interior design firm. And before that, in addition to raising her two children, she was professional singer, who often opened for well-known crooners of the 1950’s and 60’s, including Tony Bennett and Perry Como. During her surgery, Helen had a stroke. “When I was transferred to Fairlawn, I couldn’t move my left side from my shoulder to my toes, and my hand was like Jello,” she recalls. Her first weeks in rehab were no piece of cake. Just two days in, Fairlawn physicians found a blood clot in her leg. Also, because of the recent heart surgery, she was unable to use her right arm to lift, pull, or push anything, including her wheelchair. But that didn’t stop Helen. “This is a woman, who despite all the barriers she encountered, didn’t give up,” says Jessica Whalen, an occupational therapist who began working with Helen when she could not sit unsupported, stand, get out of bed or transfer in and out of a shower without the help of two people. “Basic tasks such as peeling a banana, cutting food, dressing, bathing, and toileting were all completed at a seated level or while in bed,” adds Jessica. With at least three hours of therapy a day, within less than two months, Helen had regained full motion and use of her left arm and was completing self-care tasks with little or no assistance at a seated level. “She could stand with cues and supervision to reach into cabinets and wash herself while holding onto a grab bar,” recalls Jessica. Her progress in physical therapy was just as impressive. With improved leg strength, she was walking 150 feet using a walker with a therapist’s supervision. At first needing a rolling shower chair and two therapists to transfer into the tub, with intensive therapy, Helen was able to transfer onto a stationary tub seat with minimal assistance. Once needing a rolling shower chair and two therapists to transfer into the tub, Helen now transfers onto a stationary tub seat with minimal assistance. Upon discharge, with Helen’s go get ‘em attitude and supportive daughter, Jennifer was also optimistic about her patient’s ability to improve her leg strength and balance. At that point, Helen’s long term goal was to walk independently with a walker so she could function in her own environment. Now, just a year after her discharge, Helen is doing that and then some. Living independently – doing her own cooking and self-care – she regularly walks with a group of women from her apartment complex. “And, often, on my own, I walk to the corner of the street up to the neighborhood market,” she says. And although she was unable to re-open her real estate company, Helen is definitely back to business, making referrals to other agents who then show the properties to potential clients. 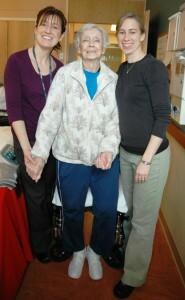 Helen Hillard is shown just before her discharge with Jessica Whalen (left), OT, and Jennifer Nadeau, PT.